Anyone experience feel a pinch of pain in the knee cap area and feeling weak to hold during the down swing?? Any suggestions before I went to see doctor?? Btw I am quite a regular golfer. Play almost every weekend. Going to range 4-5days during weekend while waiting fetching my wife. You can try wearing compression gear (at least 2 size down for 2XU attire) or use sports tape to secure your knees while u game to prevent the tissues from deteriorating. Better seek help from your GP or trusted TCM clinic for help. Your knee is trying to tell you something.. best is go for a scan. Hmm, thank for the quick response, any ideal where should I seek consult from??? Hopefully the bill won't shock me. 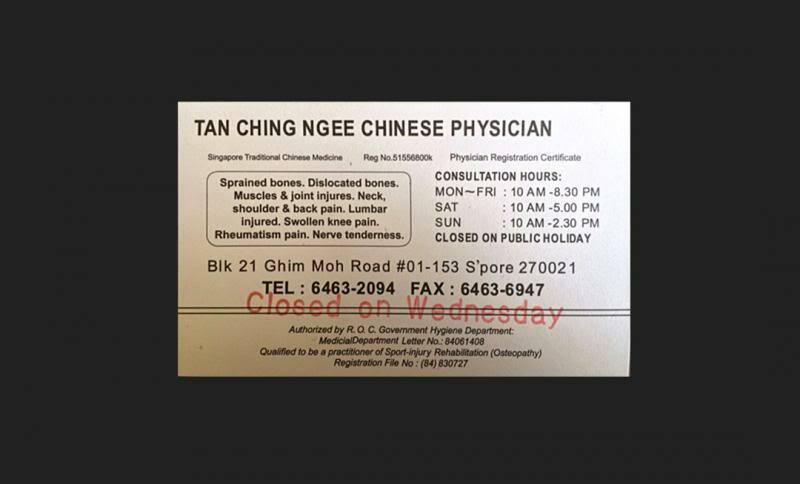 Or you can try visit a Chinese physician first... below physician was highly recommended by wushu athletes. I had tried it a few times and the results was quite gd. My wushu kidz r regular there too. Do a scan first. Seek poly clinic referral to specialist if u wan to save on the pennies but waste time. Ideally is to see a specialist and MRI your knee. It will be better to do a proper diagnosis, such as MRI, first. After knowing what exactly happened to your knee(s) and the status then decide what the best course of action is. You can visit Calvin Goh (golf specific Physio)at My Physio. Calvin has worked with PGA and NBA players during is time in America. He's located at Cluny Court (next to serene centre) he's contactable at 66982421.
just a guess, it could be ur ITB. still best to see a physio. A trip to theDoctor's will clarify. I was in your situation a couple of years ago..... What i found was torn Acl and mcl ..... Its better for you to get it checked . I think you should get a scan quickly if it gets worse. Knee injury from golf can be serious. Could be torn ligaments or worn knee cap. Resting for a while to see if it goes away is a sensible thing to do. Mine is the LCL. Still able to play but more likely to do it once a month. Everytime after the game, the knee seems out of place. Wah... So many acl and lcl injuries here! I also have! Both my acl fully torn, recon but not too successful. Also right meniscus 50% torn. Anyway, unlikely acl or lcl injuries for TS right? Coz acl & lcl usually from sudden jerking actions or impact. Sounds like meniscus or knee cap wear. Do check out & see which GR 'doctor' is correct. Better slow down, put on a knee support and see a doctor. Thanks for the response, been reducing the golf session.. such as driving range and wear lighter shoes. Currently I will put On knee support, every time after my range session or course, I could feel a bit weird feeling at knee. usually when you start extensive golfing and felt the knee weak and have trouble when taking stairs (pain) means lack of glucosamine. Try to take higher doses of glucosamine for 2 weeks then keep yourself supplied, the knee will improve. Its happen to me and my soccer friends. Some say weak knees cause by too much isotonic drinks. lol... not cause by shake too much on bed? Shaky bed means time to go ikea. I thought my knee has worn off and requires surgery. I consulted Sports Doctors, Physiotherapist and they got a lot of BS for me. They suggested going for MRI scans and some sessions of Electro/Physio treatments. The best of all, the pain/strain has not subside after. he said it is just a slight sprain that caused some swelling and blood clog on the knee. After 1 session of treatments, I can feel my knees are back to normal. I went back to him about 2 weeks for some "fine tuning" and that it.